In a medium bowl, mix the ricotta cheese, Coronado® Dulce de Leche Caramel and eggs until smooth. Add the flour, baking powder, baking soda and salt, mix well until completely incorporated. Lastly, add the lime juice and zest, mix again. Preheat a large nonstick skillet or griddle over medium-low heat for at least 5 minutes. Once hot, add enough butter or oil to cover surface. Ladle ¼ cup pancake batter per pancake, cook for 2 to 3 minutes on the first side, flip and cook for 1 to 2 minutes on the second side. 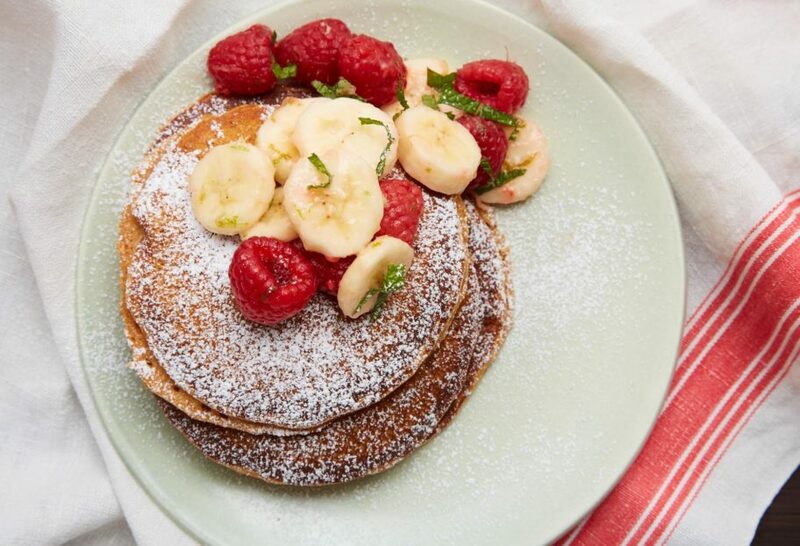 Serve sprinkled with confectioners’ sugar and fruit of your choice. Just saw the Dulce de Leche pancake recipe and I would love to make them!! Yum! However, I don’t believe I can find the Coronado dulce de leche in my neck of the woods… can I substitute with something else??? Thank you!! You can use any Dulce de Leche you find in your local market’s International food aisle. Enjoy the pancakes, Bianca! I just saw your show with the pancakes. Im making them this weekend for my wife and I. Love the Guadeloupe Valley tambien. Hope you and your wife love them, Joe! Hi Pati! I love your recipes! This looks delicious! I’m having trouble finding a bottle of Coronado’s topping that looks like the one you used in your video. They all look slightly different. Do you happen to have a link to where you purchase it? Here’s their website, Elena: https://www.barcel-usa.com/coronado Enjoy the pancakes! Wish you continue success with your show and many blessings. Oh I’m so glad you found the recipe, Lilliana…and loved it! La Cocina de Dona Esthela looks like a wonderful place. And I can’t wait to try your recipe for the pancakes. They look delicious! Oh I had so much fun there! Enjoy the pancakes, Genie. Hola Pati! What do you think about making this with whole wheat flour ? Any changes you would make? Go for it, Jasmine. You can make them the same way with whole wheat flour. It is a thick batter, but you can add some milk to thin it out, Alma. Enjoy! This is perhaps one of my new favorite sweet dishes in this show so far! I’ve always loved pancakes since I was a wee child, but my mom always made them out of a box. When it comes to my grandmother, however, she was the first to make them for me from scratch whenever we’d visit her down in San Salvador. And lo and behold, now being older, she told me her recipe and I’ve started making homemade pancakes myself, but experimenting a bit (By the way, you’re right about the baking soda! I tried that with the baking powder last time I made pancakes even before seeing this episode, and no wonder they had a better result!). But now, I think I’ll try making these for her and see what she thinks; I hope she loves them! Oh I hope she loves them too, Carlos! Say hi to her for me. We Love your show Pati, and are always excited to see where you go next especially since my family is from Mexico and we get to see when you visit where my family is from. Sometimes I take a picture and send it to my mom and tell her, “Pati’s in your town (Michoacán)!” 😄. My husband and kids have never been to Mexico so I share my experiences, past times, and how much I miss it and our family there. We love your food and have recreated many of them. We enjoy just watching and listening to your stories also and when you add your children and family along your journey and cooking. My husband is the main cook in our home and his favorite is Mexican food and always looks forward in making authentic Mexican food with my Mom. My mom has a Mexican accent when she speaks English so it reminds my husband (who’s 0% Latino) and how he loveingly teases her. Accents rock and since our kids spoke mainly Spanish when they were really little they also had an accent. Thank you so much Sylvia! I hope you have a very Happy new Year too. I watch your show on mpt 22-2 outside of Annapolis, Md. I love you, your famly, as well your show. Your warmth and love of what you do shines through. Not to mention the wonderful recipes and beatiful experiences traveling in your magnificent country. I can’t wait to try so many of your dishes on my family and friends. Thank you so much for sharing your wealth of knowledge. Thank YOU for tuning in, Nancy. I hope you love all the recipes…and continue to love the show.